When I first saw the sign for Hot N Juicy Crawfish in Woodley Park, I thought, “wow, they put one of those Chicken/Chinese/Wings/Subs places in, weird.” Then after a little bit of Internet chatter, it came to be known as “the place from Man v. Food” which isn’t normally the best judge of gourmet cuisine, but at least I knew a high volume of their food didn’t give Adam Richman deathly food poisoning. And then in honor of their grand opening, the restaurant was offering a pound of free shrimp, no questions asked. With that offer legitimacy was down but intrigue was up. I decided to go for it. Food poisoning isn’t as bad when you don’t pay for it, right? Well lucky for me, I got a free pound of shrimp without a side of tummy ache. In fact, it was quite delicious. But let’s back up a bit. 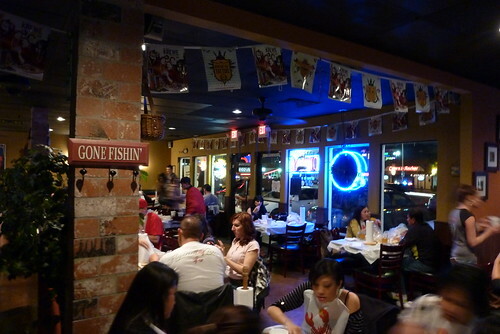 Hot N Juicy is the second location of the Vegas restaurant of the same name. Usually when I think to myself, “what’s a city like Vegas…” Washington isn’t exactly the first thing that comes to mind, but hey, I’ll take it. It’s a sports bar for lack of a better word, or at least a sports bar somewhere down on The Bayou. You walk in and it’s beer signs on the wall, wood paneling, a big ol’ bar and some boisterous customers. Unfortunately it wasn’t too much of a bar while I was there since they didn’t have their liquor license fully certified yet, but the word is that they should be serving up booze (barring any shenanigans) by today. But as I said, this ain’t a traditional sports bar. The tables are covered in sheets of plastic (it comes across more crab feast than Patrick Bateman), drinks are served in Styrofoam cups and napkins are big rolls of paper towels. Eco-friendly this is not. And just to make sure to stay in character, your meal is served to you in a plastic bag carried around in a beer bucket. Class-y. But it works so, so well. So much so that it led my friend Mike to remark, “you know, we really don’t eat enough food from a bag.” So true, friend, so true. We were drawn to the shrimp since, you know, they were free. There are plenty of ways to customize your shellfish order, both in marinade flavor and spiciness level. The staff pushed the “hot n juicy” marinade on us since it’s a crowd favorite as well as the restaurant’s namesake. Unfortunately “hot n juicy” isn’t exactly descriptive when it comes to flavor profiles, but it was pretty great. It reminded me a lot of gumbo with a deep, complex creamy flavor and a little kick on the end. Our waitress scared the bejesus out of me when I ordered my shrimp spicy, so I ended up with the medium and kind of regretted it. Don’t be afraid of the spice, folks! It’s really not that overwhelming and definitely adds to the meal. We ended up ordering our shrimp medium spicy, then ordering a bowl of the extra spicy sauce on the side. A perfect compromise if I do say so myself. One thing must be said about the shrimp as well as the crawfish, they are head-on. If you’ve never had to deal with head-on shrimp before, it can be a little scary. A word to the wise: twist and pull and it’s over in a jiff. I passed on sucking the heads, but our friends who did said it made the dish and they definitely looked cooler for it. There is more to Hot N Juicy than free shrimp. We also had an order or two of the crawfish since it is in the name, though I say stick with the shrimp since crawfish are just too damned much work. We had an order of the Cajun fries (standard fries with some spicy seasoning) and the sweet potato fries (yum yum), which were both good but were especially important as implements to get more of the extra sauce in our bellies. Mission accomplished, fries, we thank you for your service. There was a plate full of raw oysters that went around the table (I declined), that got high marks for its simple preparation served with a bottle of Tabasco and a few slices of lemon. Though the food is quite good, especially for food served in plastic bags, the best part of Hot N Juicy is the built in social adventure. This meal is best shared among friends who don’t mind shooting crawfish bits at each other (intentionally or unintentionally), or wiping their disgusting hands on each others napkins. The staff is super energetic in a surprisingly not annoying way, and is more than happy to help you tie your bib, recommend a spice level, or shake a leg when you’re dying for a little more Diet Coke after overdoing it on the extra spicy sauce (guilty!). So go forth and eat shellfish from a bag, but for the love of all things holy, do not go here on a first date. 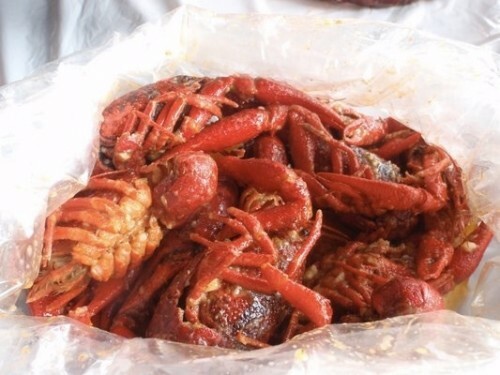 Hot N Juicy Crawfish is located at 2651 Connecticut Ave. NW. The closest Metro station is Woodley Park/Adams Morgan (Red Line). For more information, call 202-299-9448.
so happy to have a new option in woodley. 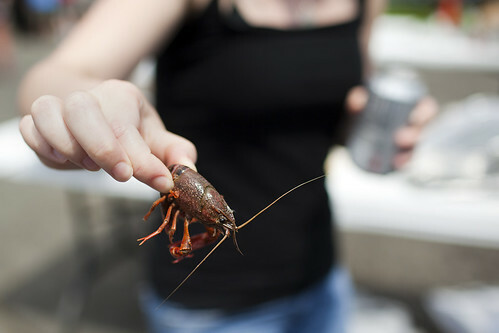 As a born and bred Louisianian, I must say: crawfish always trumps shrimp. So glad to know about this place! Thanks for the ‘first look’! OMG! I CAN’T WAIT TO GO HERE! Born and raised in south LA, there is nothing like crawfish season to make a girls mouth water nonstop. I just found this website today and I have been dying for crawfish! I have tried for the last month to talk my husband into taking a special trip to visit my ‘folks in LA just to eat crawfish! Now we can save the money and have the folks come here! We will be there tomorrow immediately after work! I can’t wait, I will be dreaming of crawfish tonight!